Join us for the 86th Annual Tigris Shrine Circus! Ladies and Gentlemen, Boys and Girls and Children of All Ages, it is once again time for The Shrine Circus... now in its 86th year! Come see the Three Ring Circus featuring High Wire Acts, Tigers, Flying Trapeze, Jugglers and a whole lot of Clowning Around! The Shrine Circus provides a quality, fun-filled family experience with proceeds going to a great cause - the good work of Shriner's in your community. So hold on to your seats and on with the Show! Each show approx. 2-1/2 hours (includes half-hour intermission). 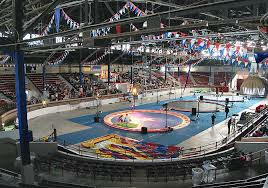 The Tigris Shrine Circus is the local main fundraiser which then helps support The Shriners worldwide. March 29, 2019 @ 7:00 p.m.
March 30, 2019 @ 10:00 a.m., 2:30 p.m., or 7:00 p.m.
March 31, 2019 @ 1:00 p.m. or 5:00 p.m.